Jesus jumps right in at the sign of trouble. He longs to come to our defense, take on our burdens and wade on into the nitty gritty muck of our lives. We don’t have a Saviour who sits all handsome up on His throne, watching what is going on from a distance. 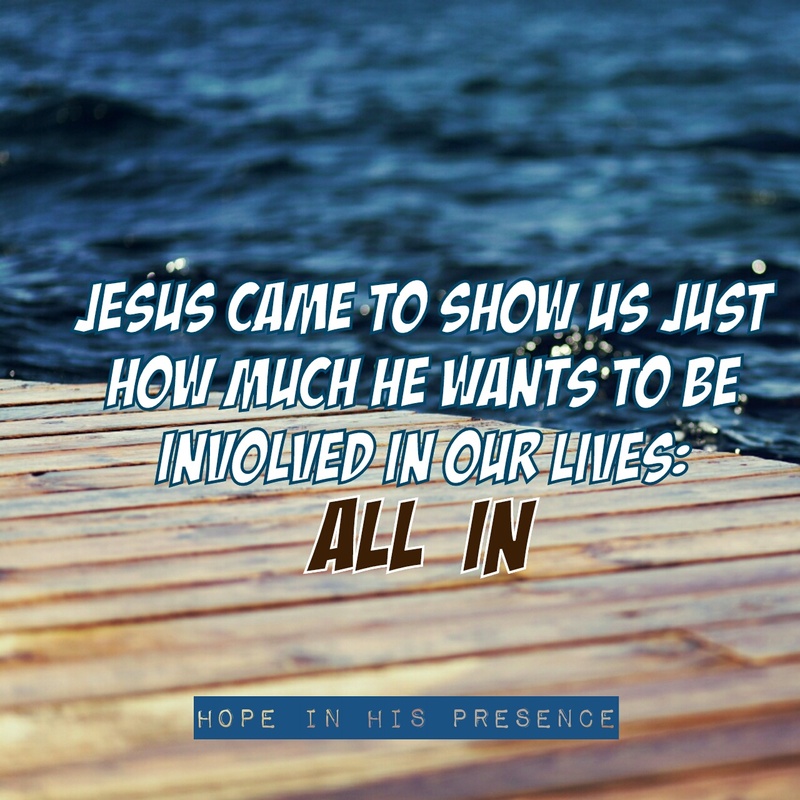 Jesus came down among us to show us just how much He wants to be involved in our lives: all in. I am so thankful I follow a God who wants a hands on relationship with me. gave me His Spirit to guide, teach & comfort me all ways. Jesus wasn’t afraid to get His hands or reputation dirty when He lived among us. Any request from the heart was answered. He is all in wanting a relationship with each of us. Are you holding back, or are you ready to wade in above your head and put your all in? He will be there to catch you. Because He is all in, no holds barred, He is right there waiting for us! Not only is He always with us, He is always ready to come to our defense. Tired of holding back? Afraid of making the leap. Sometimes we just have to do it afraid to find out just how strong and present He really is! I love it when I find myself next to somebody that I know on a link up. Enjoyed reading your post today. Blessings! Me too 🙂 Bless you today!